When traveling in Mexico, I've had occasion to discuss corruption in the United States, in comparison to Mexico. "Is there corruption in the United States," I've been asked. "Of course," I've replied. "There's corruption everywhere. But is there corruption like in Mexico? Where a governor will simply take the state treasury with him when he leaves office? No, we don't have corruption like that." After looking at the Bush Administration's proposed bailout, I'm going to have to revise my answer. I've always thought that Karl Rove's goal was to turn the Republican Party into a U.S. version of the PRI. Now we're seeing the fulfillment of that plan. ... This picture makes me think of John McCain. “Witchcraft is a sad reality in many parts of Africa, resulting in scores of deaths in Kenya over the past two decades. Bishop Muthee’s blessing, then, was simply a reflection of his cultural understanding of evil. While others are not obliged to accept his interpretation, all can be expected to respect it. More than that—Muthee should be hailed for asking God to shield Palin from harmful forces, however they may be manifested. And for this he is mocked and Palin ridiculed? That would be all well and good if the "witchcraft" that Pastor Muthee became famous for pursuing were truly some kind of Dark Art from the Dark Continent, bent on the persecution of Christians (though it would be good of him to present some actual examples of said "witches" too). So when Pastor Muthee prays for Sarah Palin's protection from "the power of witchcraft," it is with a, shall we say, expansive view of what constitutes "witchcraft." And when he demands we "crush the python spirit" and "step on its neck," you have to wonder whose necks they're talking about. Democrats? Lyda Green? 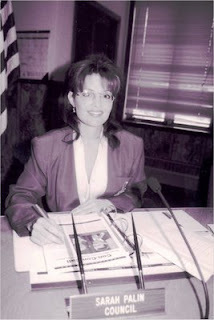 Anyone who opposes Sarah Palin and her "infiltration" of the "political realm"? And when Bill Donohue defends a "witchhunt" of the kind Muthee purused in Kenya ... well, it's not very persuasive. After all, this is the same guy who insisted that Mel Gibson wasn't really anti-Semitic. By the end of the second day of Muthee’s sermons, the church had been tipped off about me, the liberal media member in its midst. An associate pastor told me he had received an email from an anonymous source warning him about me. When I tried to interview members of the congregation in the church parking lot, my questions were either met with silence or open hostility. I strongly suspect the McCain campaign has mobilized the Wasilla Assembly of God against perceived threats from the media. The video of Pastor Muthee has to be seen to be believed. Especially as he prays over Palin. A flier left on driveways in a neatly packaged plastic envelope and distributed by a group named the League of American Patriots, with a Butler mailing address, questioned, "Do You Want A Black President?" and stated "Black Ruled Nations most unstable and violent in the world." ... Roxbury resident Elizabeth Corsetto said she and her husband came home from doing errands Saturday and found the flier at the end of their driveway. She picked it up, expecting a mailer from a retailer but instead found a one-page, black and white sheet featuring unflattering photos of Obama, including a doctored one portraying him with a long beard and turban. "Why should we seal our fate by allowing a black ruler to destroy us?" asked the flier, which also detailed what it contended to be a series of facts on black unemployment, poverty, HIV and crime rates, while pointing out the woes of a couple of predominantly black-populated countries. Another racist publication, from the neo-Nazis who brought you the 2006 Toledo riots, even went so far as to publish a coy magazine toying with the suggestion that Obama be assassinated. My investigative piece on the Minutemen and their finances is now available in this month's edition of The American Prospect. It's essentially a portrait of a right-wing movement in decline, largely under the weight of financial mismanagement and the paranoid style right-wing populists specialize in. And as I make clear in the piece, the trajectory of Minutemen almost precisely traces that of previous right-wing populist movements -- particularly the money-grubbing aspects of it. The Minutemen, really, have been a right-wing moneymaking scam from the get-go, and this piece explores that. There's a snippet of it available online for non-subscribers. And if you're a TAP subscriber you can read the whole thing. Certainly there was a significant gap between Simcox’s public claims of having raised $1.6 million for the fence, and what his financial disclosure forms show his organization actually spent on it. No one can say for sure because the MCDC won’t let anyone touch its books. But a look at the organization’s 2006 public filings indicates that, of all the money raised for the border fence, only a small amount (if any at all) went toward its construction. The forms for the Declaration Alliance—through whom all the border-fence donations were directed—show that it brought in nearly $5 million that year for all its programs. What percentage of that $5 million consisted of border-fence donations is unclear, but considering that the fence appeals began in May 2006 and have remained the MCDC’s (and Declaration Alliance’s) chief fundraising focus in the months since, it is likely that they provided at least a majority of that money. It also shows that $3.19 million went to the MCDC. But for what? says it spent on the MCDC—and you estimate that at least half of that is fence-related—then we’re talking about less than 6 percent coming back to build the fence. In other words, the best rough estimate is that about 94 cents of every dollar Jim Campbell spent on the fence went toward printing, mailing, consulting, and the like. It’s no wonder members at the field level were seeing so little of the money that Simcox claimed to be rolling in. Be sure to pick up a copy if you're not a subscriber. I'll make sure you all know when the full piece is finally available online. Yesterday morning I interviewed John Stein, the former Wasilla mayor who was defeated by Palin in 1996 by using "a quiet campaign by some Palin supporters raising emotional issues like abortion and gun control, which had no apparent tie to municipal politics" -- and as Phil Munger notes, a whisper campaign that Stein was secretly Jewish (Stein is a Lutheran). According to Stein, Palin's main base of support in that election (and subsequent Wasilla campaigns) was derived from her fellow congregants at Wasilla Bible Church and the larger evangelical Christian community. But it also included some of the Mat-Su Valley's biggest far-right nutcases -- to the extent that she even attempted to reciprocate by appointing one of them to the city's planning commission. The connection revolves mostly around three men known to have far-right leanings in the community: a builder named Steven Stoll, a computer repairman named Mark Chryson, and a third man named Mike Christ. All three subscribed to a bellicose, "Patriot" movement brand of politics -- far-right libertarianism with a John Birch streak. According to Stein, Steven Stoll -- whose local nickname, according to Phil Munger, is "Black Helicopter Steve" -- was involved in militia organizing in Wasilla the 1990s, and subscribed to most of the movement's paranoid conspiracy theories: "The rumor was that he had wrapped his guns in plastic and buried them in his yard so he could get them after the New World Order took over." Will the Latino vote decide Election 2008? Three of those states (Colorado, Nevada, and New Mexico) have Latino voting blocs more than large enough to decide the outcome. For both campaigns, this race is coming down to the ability to inspire Latino voters. With polls consistently showing Obama holding a 2-1 advantage among those voters -- particularly in those three states -- that's good news for Obama. But he can't afford to stand pat, either. It's true that Obama has done a fine job recently of attacking McCain for his two-facedness on immigration. But at the same time, as Roberto Lovato has adroitly observed, immigration has been put on the backburner as an issue for Democrats. This was especially the case at the Democratic National Convention, where the only discussion of immigration came early in the final day, in the form of speeches by Rep. Luis Guiterrez and Bill Richardson (as well as a brief mention in Obama's acceptance speech). It's not enough to point out that McCain has been trying to play both ends against the middle on immigration. To win these voters, Obama needs to enunciate a vision of immigration reform built on common sense and the wisdom enough to see the big picture. It's an opportunity to demonstrate real leadership. As it turns out, the election could depend on it. The economy will be this campaign's landmark issue, no doubt -- but making the right play on immigration could prove decisive in a neck-and-neck contest. John McCain's campaign-long attempt to play it both ways on immigration -- pandering to his party's nativist wingnuts while attempting to tell Latinos he's their pal (just don't tell anyone) -- is finally starting to catch up with him. America's Voice has an ad calling him out on it. As you can see from watching it, it's very effective in making clear his hypocrisy in falsely blaming Obama for the failure of comprehensive immigration reform in 2006 -- when in fact the fault lay with the raving xenophobic wing of the Republican Party. Rush Limbaugh (whose constant use of demeaning stereotypes when he talks about Latinos played a substantial role) in particular has been whining that "Obama is stoking racial antagonism" by supposedly taking his quotes out of context. But when Limbaugh offers the actual context, it's clear that, indeed, he was indulging demeaning stereotypes as usual. Epic fail, dude. Indeed, it is to laugh: Obama is stoking "racial antagonism"? This, from the guy whose unending defense of "white culture" and constant attacks on multiculturalism are staples of his massively popular radio show? This, from the guy who told his audience that Obama should just "renounce his race" and "become white"? The guy who informed us that Donovan McNabb got ahead in the NFL because he was black? The guy who calls illegal immigrants an "invasive species"? Also muddying the water has been conservative Latino columnist Ruben Navarette, who insists that the McCain ad is perfectly accurate. Um, well, maybe not so much: Frank Sharry has the definitive response to Navarette. Oddly enough, McCain's prevarications on immigration haven't been tallied among the naked falsehoods he's been peddling lately. But really, they are among the clearest examples of his two-faced approach to politics.